SpermComet® is the next generation of DNA fragmentation test. Older tests measure the number of sperm with DNA damage but not the amount of DNA damage. In contrast, the SpermComet® quantifies the amount of DNA fragmentation in individual sperm enabling the heterogeneity of the sperm population to be assessed. Understanding the variability of DNA fragmentation within a sample strengthens the SpermComet®’s ability to diagnose male infertility and predict a live birth with IVF or ICSI. 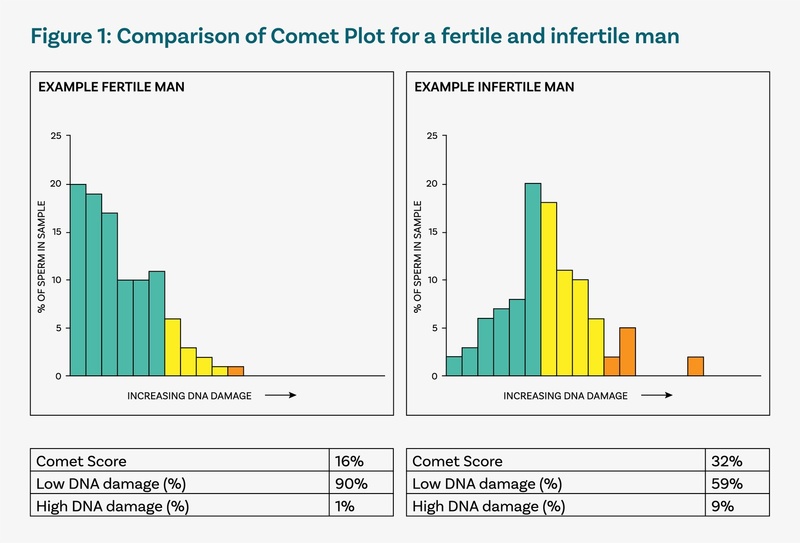 Comet Score – the average DNA damage per sperm in the sample. Low DNA damage (%) – the proportion of sperm in the sample with good DNA needed for a successful pregnancy. High DNA damage (%) – the proportion of sperm in the sample with poor DNA unlikely to lead to a successful natural or ART pregnancy. The patient’s Comet Plot is compared against a reference Comet Plot for a typical fertile man. Most of a fertile man’s sperm have low levels of DNA damage. In contrast, an infertile man has fewer sperm with low damage and more sperm with higher damage (Figure 1). To diagnose infertility, each patient result is compared against a reference range for fertile men (Table 1, fertile range). Patient results that fall outside the fertile range indicate a high risk of male infertility. The Comet Score should be compared first. If this is borderline, then the low and high DNA damage results provide additional data to confirm the diagnosis. To select the optimal treatment, each patient result is compared against a reference range for men who have had an IVF live birth (Table 2, IVF range). Patient results that fall outside the IVF range indicate a high risk of IVF failure and ICSI is the indicated treatment. The Comet Score should be compared first. If this is borderline, then the low and high DNA damage results provide additional data to confirm treatment selection. When ICSI is indicated, the likelihood of a live birth will be increased if sperm quality is improved before treatment.